Meet ampm’s new spokes-creature: Toomgis™. "Too Much Good Stuff" comes deliciously to life. Nearly 20 years ago, RPA created the iconic “Too Much Good Stuff” campaign for ampm convenience stores. Many years later, the tagline is still going strong, but the campaign needed to be updated for a younger audience. When the campaign began, it focused on Gen X — but today the brand needs to attract hungry millennials and thirsty Gen Y-ers, coffee-swilling hipsters and maybe Gen Z-ers with a sweet tooth. We needed a campaign that updated “Too Much Good Stuff” and ampm for a younger audience and brought to life the idea of cravings in a differentiating way. We talked to the people who frequented ampm most — and one thing became clear: They connected with offbeat humor. 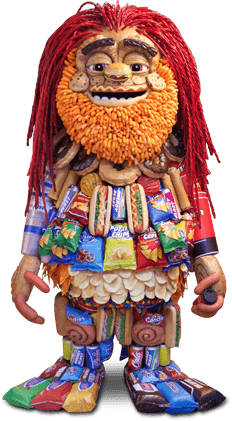 So, meet ampm’s new spokes-creature: Toomgis™. He is delicious and friendly, and always ready to help ampm fans satisfy their cravings.